Topographical Survey-Engineering/Royal Jordanian Geographic Center and French Geographic Center (IGN) jointly, 1985. Geophysical survey at the Pierre-and-Marie-Curie University (Paris VI), France; 1996. Surveying and 3D laser scanning Malta; 2005. Geophysical survey University of Arkansas, USA; 2006. Geophysical survey Aristotle University of Thessaloniki, Greece; 2008. 1986-1988: Military Survey Department and Royal Jordanian Geographic Center. 1988-1989: Surveyor at Jordanian Contracting Company, Amman. 1989-1990: Surveyor at Federal Directorate of Supply and Procurements, Yugoslavia-Jordan. 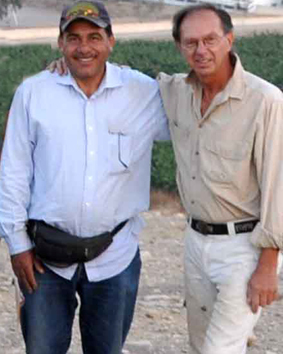 1990-present: Surveyor and draftsman at Yarmouk University; participation in numerous expeditions such as American, Italian, Swedish, Dutch, French and Jordanian. 1999-2000 Surveyor and draftsperson for the Swedish Palestine Expedition at Tell el-‘Ajjul, Gaza. 2001: One year at the Sultan Qaboos University; Faculty of Engineering and Department of Archaeology . 1992-2002: American-Arkansas / Jordanian Expedition, Sa’ad, Yasieleh, Ya’amoun and Natifeh, Jordan. 1996-present: Swedish Jordan Expedition, Tell Abu al-Kharaz, as architect and draftsperson. 1999-2000: Swedish Palestine Expedition at Tell el-‘Ajjul, Gaza. 2010-present: New Swedish Cyprus Expedition, Hala Sultan Tekke. 2012: American Expedition, Umm el-Jimal, Jordan. Isometric drawing, and reconstruction 3D using SketchUp Pro 6. Topographical survey with various surveying instruments/total station and GPS: Wild, Sokkia, Topcon, Canon. Drawings of contour maps in various scales (by hand and computer). Good experiences in as-built drawings. Drawing of objects, artefacts and archaeological finds. Arabic (mother tongue), English (good), Russian (basic knowledge). 1-The development of architectural heritage in Jordan: Funded by Abdulhameed Shuman Foundation. 2-Documentation of traditional Crafts and Handicrafts in Jordan: Funded by Scientific Research Support Fund. 3-Traditional of Handy craft in Northern part of Jordan: Funded by King Abdullah Scientific Research Support Fund. 4-Structural analysis and documentation of Complex XVII, XVIII at Umm el-Jimal: American Embassy fund. 1) J.C. Rose and D.L. Burke (eds. ), Sa’ad: A Late Roman/Byzantine Site in North Jordan, Irbid 2004. 2) P.M. Fischer, Tell Abu al-Kharaz in the Jordan Valley. Volume II: The Middle and Late Bronze Ages. Contributions to the Chronology of the Eastern Mediterranean 11, Vienna 2006. 3) P.M. Fischer (ed. ), The Chronology of the Jordan Valley during the Middle and Late Bronze Ages: Pella, Tell Abu al-Kharaz and Tell Deir ‘Alla. Contributions to the Chronology of the Eastern Mediterranean 12, Vienna 2006. 4) P.M. Fischer, Tell Abu al-Kharaz in the Jordan Valley. Volume I: The Early Bronze Age. Contributions to the Chronology of the Eastern Mediterranean 16, Vienna 2008. 5) M. El-Najjar and M. Al-Bataineh (eds. ), Ya’mun: An Archaeological Site in Northern Jordan, Irbid 2011. 6) P.M. Fischer, Tell Abu al-Kharaz in the Jordan Valley. Volume III: The Iron Age, Vienna 2013. 1) Tomb Typology at Ya’amoun, in M. El-Najjar and M. Al-Bataineh (eds. ), Ya’mun: An Archaeological Site in Northern Jordan, Irbid 2011. 2) Objects and Finds at Ya’amoun, in M. El-Najjar and M. Al-Bataineh (eds. ), Ya’mun: An Archaeological Site in Northern Jordan, Irbid 2011. 3) Traditional Buildings from the Northern Part of Jordan; Turah Survey. Annual of the Department of Antiquities of Jordan 55, 2011. 4) The Development of Architectural Heritage in Jordan. Al-Sharjah University Annual 2013.